I couldn’t have been much concerned about which route the invading Alexander took when he started from Taxila, to battle Porus across River Jhelum (Hydaspses) in 326 BC. To me, the location of the battlefield – still not clearly identified – and what exactly happened there, was more essential. All that changed when my friend Shahid Dad suggested that we retrace the likely routes, as his daughter Aisha had some new ideas that she wanted to test for a thesis in her Classical Studies major at Wellesley College in Boston. 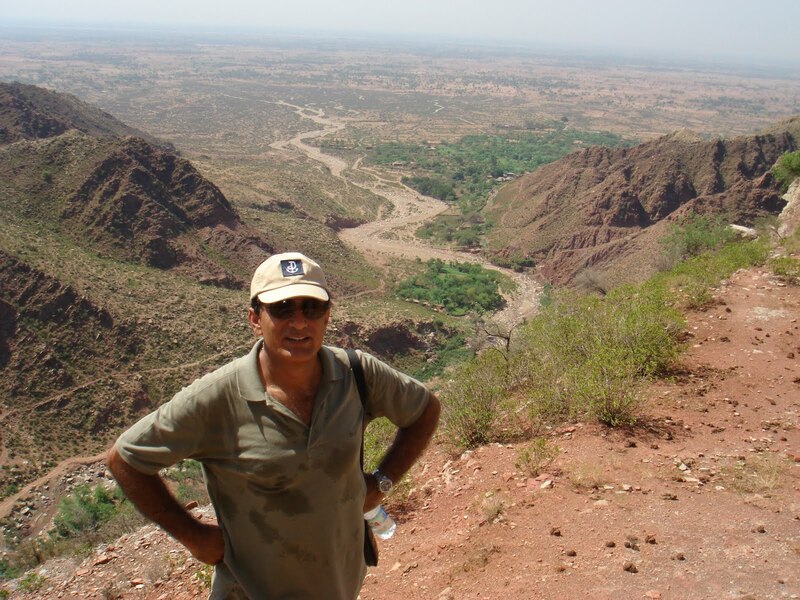 Ever too eager for a trek, I immediately paced up my evening walks to tone up for the rigours of the outing, while the mornings took up a study of Sir Aurel Stein’s On Alexander’s Campaign in the Panjab. Stein’s work is a modern day commentary on Arrian’s Anabasis Alexandri, which remains the best source on Alexander’s campaigns, though one has to allow for inaccuracies and omissions as the latter was written a good four hundred years after the events. Stein would have us believe that, just because a Ghaznavid expeditionary force supposedly descended through a narrow gorge in the Salt Range to reduce the Hindu Shahi stronghold at Nandna, Alexander would have used the same route thirteen centuries earlier! Now this line of reasoning would have remained uncontested if the opening at Nandna was the only one in the widespread Salt Range spanning almost 100 miles from east to west. In the event, we thought we could look elsewhere, with the bonus of observing some of the most colourful landscape Pakistan has to offer. Could a ‘Salt Road’ have existed in Alexander’s time for transportation of salt from the big salt mine at Khewra, if it was operational, that is? It is not hard to imagine camel and mule trains hauling the valued condiment to the markets in Central Asia, Gandhara, Kashmir, India and Persia. 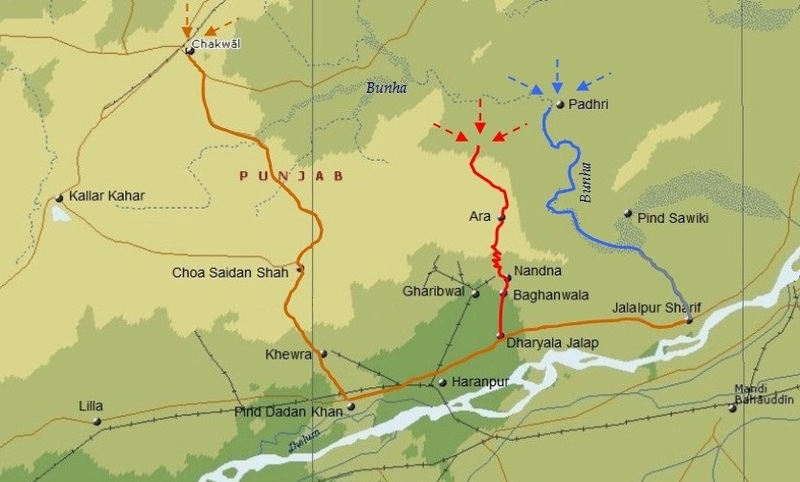 One has to only glance at the map to note that such a route may have been the precursor of today’s road that runs south from Chakwal to Khewra, then on to Pind Dadan Khan before swinging east to nearby Haranpur, the purported site of Alexander’s main camp that lay roughly opposite that of Porus across the river (see map, brown track). For Alexander to have followed such a route, it had to be effortlessly negotiable so as not to wear out his soldiers before the actual battle started, besides having sufficient forage in the crags and defiles for a cavalry of 9,000 horse. In May last year, I, along with Aisha and Shahid decided to check these ancient logistics issues while motoring in merry comfort – with no worries about hay or horseshoes, I may add! Turning off the M-2 motorway at Kalar Kahar, we headed east over a narrow road shadowed by an escarpment that runs alongside for a full 15 miles till Choa Saidan Shah. A few miles short of Choa, the Ketas Raj temple complex is visible from the roadside, so we took a detour for a short visit. A Buddhist stupa dating to the 3rd century BC is the oldest extant structure, while numerous Vedic temples attest to the reverence in which the complex was held in the later Hindu Shahi era. 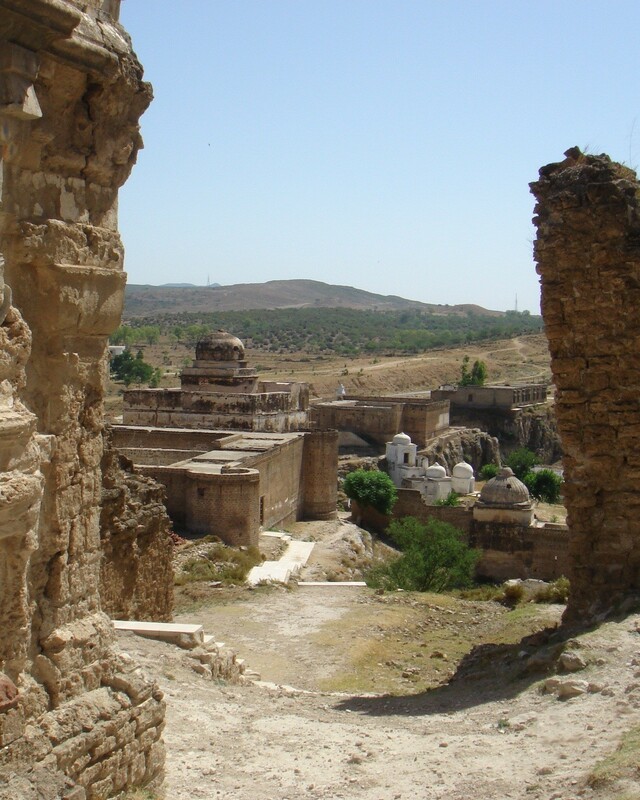 Ketas is said to have once been the centre of annual pilgrimage by Hindu devotees from all over the sub-continent. 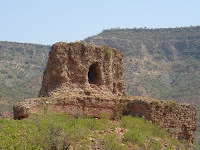 At Choa Saidan Shah, we had a tiffin of tea and patties which charged us up for a more difficult stretch till Khewra. The constantly winding road provided breathtaking views, only to be blighted by the ugly smoke emanating from Dandot cement factory. A visit to Khewra salt mines was not scheduled so we pressed on to Haranpur, which is about as unremarkable as any other small town of Punjab. As we took a roadside break, everyone agreed that the route, while the most direct from Taxila, had some very difficult stretches that could have severely taxed Alexander’s force. Nonetheless, the lore about the famous conqueror is so deeply ingrained amongst the locals that just about every village or small town of Potohar boasts of Alexander having having stopped there for a rest before taking on Porus! Our next destination was Alexander’s river crossing point, which is reported by Arrian to be 150 stadia (17 miles) from the main camp. Arrian further states that, “there was a headland ascending from the Hydaspes at a point where the river made a remarkable bend”. Stein interprets this headland as the “precipitous spur projecting from the Salt Range which terminates with its south-western corner just opposite to Jalalpur”. 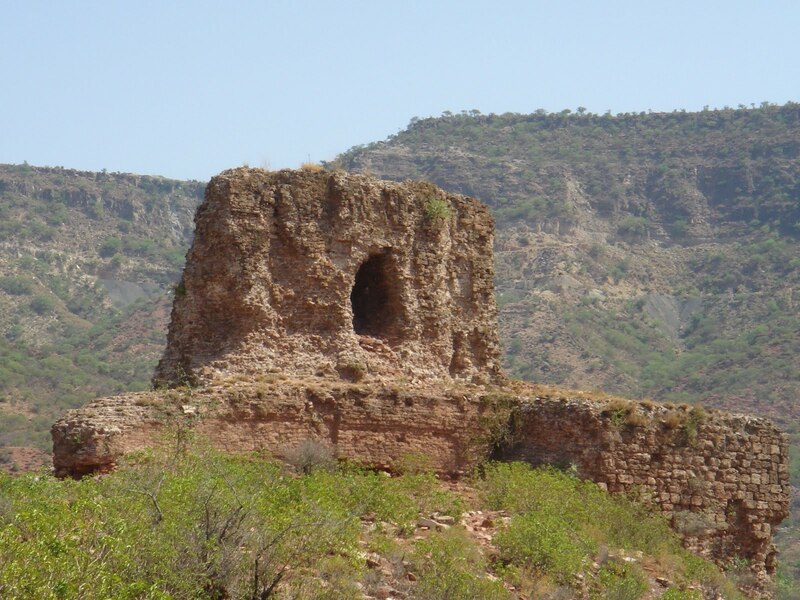 Covering the 17 miles to Jalalpur Sharif was straightforward and, without wasting much time, we drove to the little known but high sounding Alexander Monument and Research Centre. 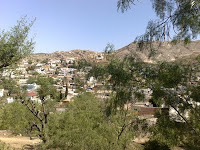 The complex abuts a torrent bed whose name Kandar Kas (kas = nullah or rain stream) would surely ring a bell with etymologists; the nullah passes by the eastern edge of the town before draining into River Jhelum. What a disappointment to see an interesting building locked up and no one to tell us what it was all about! With not even a chowkidar anywhere in sight, we decided to visit it again at a later time, for we had yet to explore other possible routes culminating at Jalalpur Sharif. A month later, we set off on our next trip to Nandna temple and fort ruins, which overlook a defile from where, it is said, any expeditionary force coming from the north can conveniently debouch on to the plains of Punjab. Breaking off the motorway at Lilla Interchange, we drove past the familiar Pind Dadan Khan and Haranpur before stopping at a quaint-sounding Dharyala Jalap, where ‘Doctor’ Khalid Qazi was waiting for us as a guide. Khalid is a compounder and runs a small home dispensary in Jalalpur, but seemed to be more of an expert on all things Alexandrine. We had heard of him during our last visit to Jalalpur and had requested his help for the next trip; he graciously decided to forego his thriving practice for a day, to join us this time. With four of us and our driver seated in the two cabins of a 4x4 pick-up truck, we set course for Baghanwala, a mere five miles north (see map, red track). A verdant settlement with lush gardens and spring water streams was a welcome sight, amidst the stark and rugged terrain all around. A few surprised locals were at hand to help us through the scrub-lined cobblestone path that led up a steep rock face. The ruins of the Nandna temple were visible high up against the skyline and to get there, it took us half an hour’s trek through an idyllic oasis ringed by small hamlets and several mills run by stream water. Grazing camels, donkeys and goats harked back to a scene which may well have been some millennia past. We were told that a narrow road built in recent times led from the nearby cement factory at Gharibwal to the village of Ara and beyond. That was good enough reason not to attempt a hike through the craggy hills and, hurt an ankle or two in the effort. We, therefore, pressed on in our 4x4, though in a direction opposite to what Alexander supposedly followed. Ara is a small settlement on the edge of a picturesque plateau that offers breathtaking views, with the lush foliage teeming with birds of all feathers. From Ara, we could view Nandna in the distance and, the rough and convoluted terrain in between only reinforced our doubts about this route. We took a break at an ancient stepped well (baoli) whose concealed location, our guide Khalid knew very well. The location of the baoli testified that some time in the past, Ara may have figured as a way station for weary travellers like us. The baoli had not dried up and in fact, it was being used to pump water to someone’s private gardens nearby. 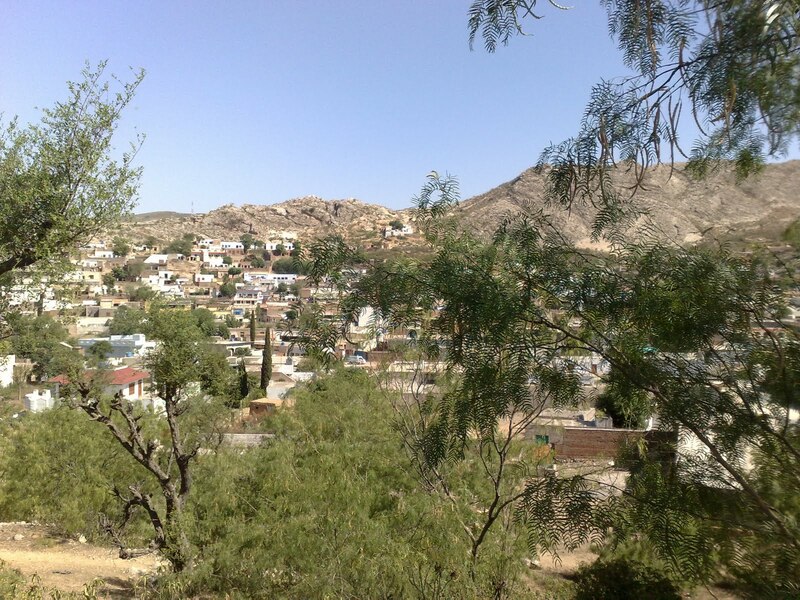 It is a pity that not many people know about the tranquil getaway that Ara is. We all thought of a dream farm house here, some day, much in preference to any at Bedian Road or Chak Shehzad! Still harbouring doubts about the two routes explored, we decided to investigate yet another one. Aisha, incisive as always, pointed out that any heavily-laden expeditionary force would find the mere sight of hills daunting, and it would be worthwhile finding a bypass. Khalid suggested that we drive through the dry bed of River Bunha, a rather long, winding rain torrent that skirted the heights and eventually drained into River Jhelum. To our good luck, the driver of the pick-up was well-familiar with the terrain as he had brought his sahib on many a hunting trip in the past (before hunting was prohibited, we assumed). From Ara, we headed in a north-easterly direction along a narrow broken road that eventually led us to Padhri, where we intercepted the river bed. We learnt that this bed turns into a torrent a few miles south of Chakwal and meanders east till Padhri before bending south, whence it opens out in a large fan near Pind Sawika. From there, a narrow road leads to Jalalpur Sharif, astride Kandar Kas during the last few miles (see map, blue track). One could see that a south-bound expeditionary force could catch the Bunha bed anywhere during its 50-mile traverse and, get to Jalalpur quite effortlessly. We noted that grazing was ample and there were plenty of pockets that had retained water from the last rains several months ago. The only caveat to this alternative route is that in rainy season the river bed would turn into sludge and marsh, so Alexander would have to have marched through before the monsoons came. Of course his local guides, possibly from the Taxiles Legion made available by the confederate Raja Ambhi, would have known of this route as well as the vagaries of weather. The drive had become bone-jarring by now as we had spent the better part of the day over hills and vales, half of it trekking. Khalid also seemed to be getting edgy, but we knew he’d get his smile back, on seeing the waiting room full of patients. We eagerly looked forward to his promised tea when we reached his home/dispensary. 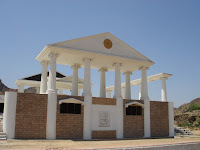 Late in the afternoon, we reached the Alexander monument at the northern reaches of Jalalpur town. The structure’s baked brick walls, classic Grecian portals and rather vainly fashioned Ionic columns, left us unsure of what to make of its architectural style. An ill-conceived research facility funded by the Greek government and several NGOs, as well as some keen individuals, it never developed beyond the basic structure and is in a state of abandonment since its inauguration in 1997. Money might have been better spent if it had been a scaled-down memorial signifying the place of assembly of Alexander’s forces, and no more. Perhaps the Greek government (with the consent of other donors) could still gift it as an educational facility to Jalalpur Sharif. Any takers for ‘Sikander Primary School’? The last item of the day was sumptuous tea at Khalid’s place. He turned out to be quite an antiquarian when he showed us several pieces, including his coin collection of various Muslim eras. The pièce de résistance was a huge and very heavy article carefully wrapped in sheets, which got us wondering, till he unveiled it. It was a mammoth (3’x2’) copy of the Granth Sahib, the Sikhs' holy book, printed at Amritsar’s first press at the turn of the previous century. Khalid told us that it was left behind by the Sikh owners of his present house at the time of Partition. Khalid’s entrepreneurial spirit showed up when he allowed that he would try to rope in some Sikh yatrees for a bid, when they next visited Punja Sahib (at Hasanabdal)! As the journey came to an end, we were all glad at having spent yet another useful day in the Salt Range; Aisha was no less thrilled at having gone through an adventure few girls in Pakistan can dream of. I, however, have yet to ask the young Classical Studies scholar as to how it mattered whether Alexander passed through Khewra or Baghanwala or the Bunha bed, as long as he was in time to meet Porus! This article was published in the daily newspaper The News International in two parts on 8 May and 15 May, 2011.